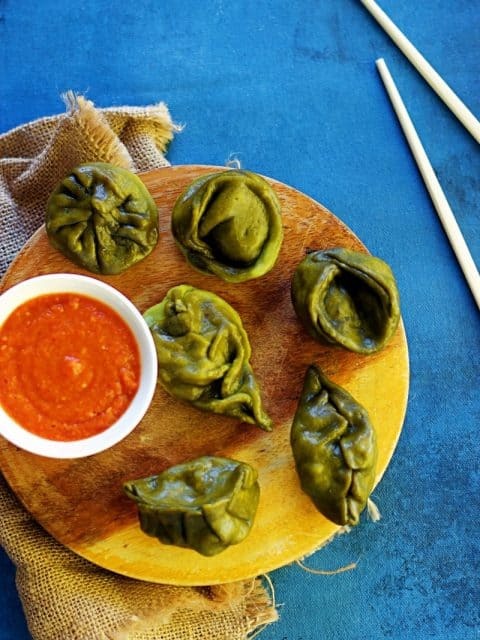 Palak Paneer Momos is basically momos that is made using a spinach dough and a paneer stuffing. This is a very popular street food from India. 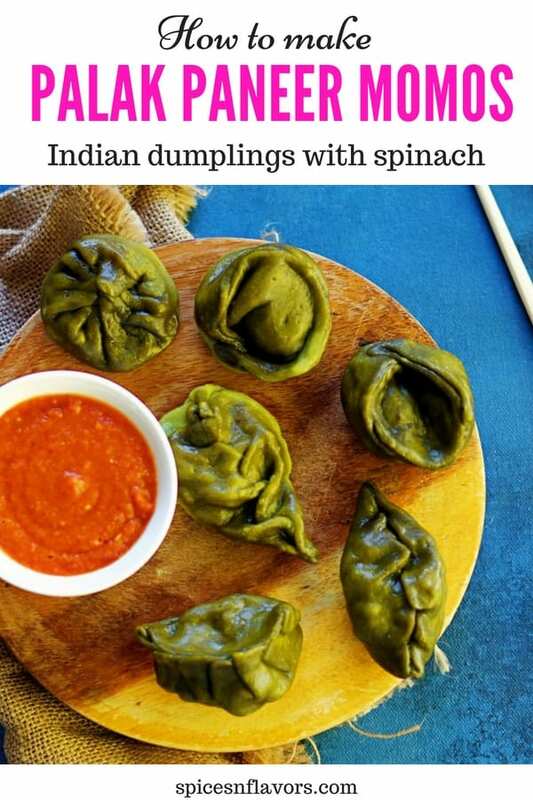 What is a Palak Paneer Momos? 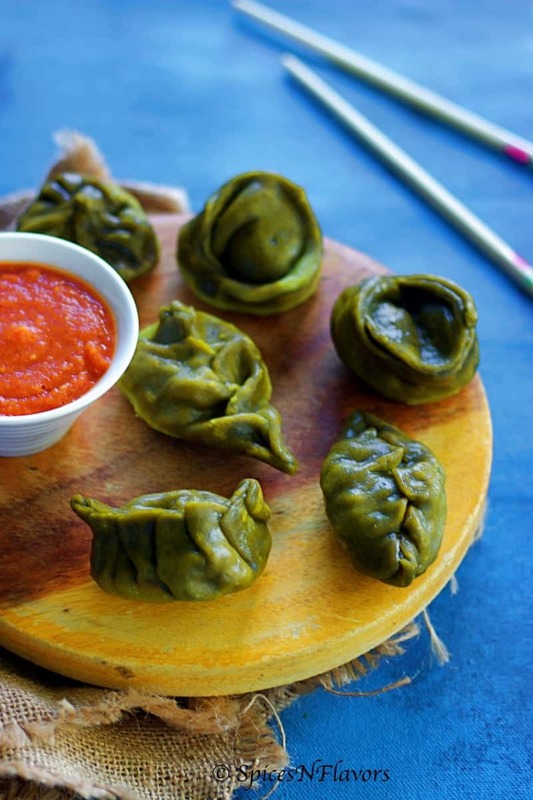 Well momos is basically a South Asian dumpling that is native to Nepal. But now is gaining so much popularity amongst Indians. Indians love street food be it any type and these momos made from flour and served with hot and spicy momos chutney tops the list these days..
Palak is basically Spinach and Paneer is Cottage Cheese so basically this Palak Paneer Momos has a dough that is made from Spinach puree and stuffed with all time favourite Paneer and Potato filling. The Paneer and Potato filling that I have used in this recipe is my all time universal favourite recipe. It is packed with so much flavour. This is spicy yet subtle, sour, chatpata, proportionately salted infact everything that you would love in an Indian food. I use the same stuffing recipe to make Paneer Koftas or even stuff in vegetables like I did in my Stuffed Capsicum Rings. 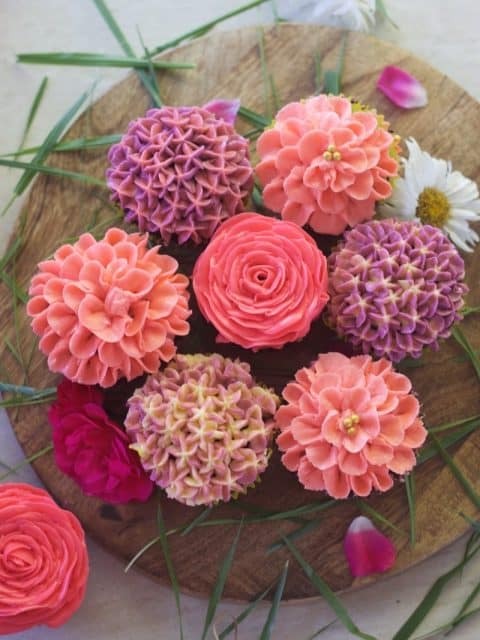 So perfect with your tea time. 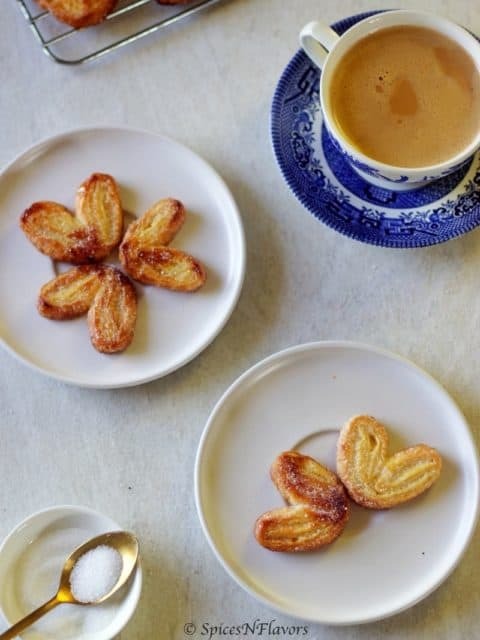 In fact I am visualising an evening tea with my bunch of dearies some stuffed capsicum rings, my checkerboard cookies (which by the way I made in pressure cooker and shared an oven version too) and Microwave Halwa ready in 18 mins flat with a cup of piping hot Masala Chai.. uff I am already salivating. 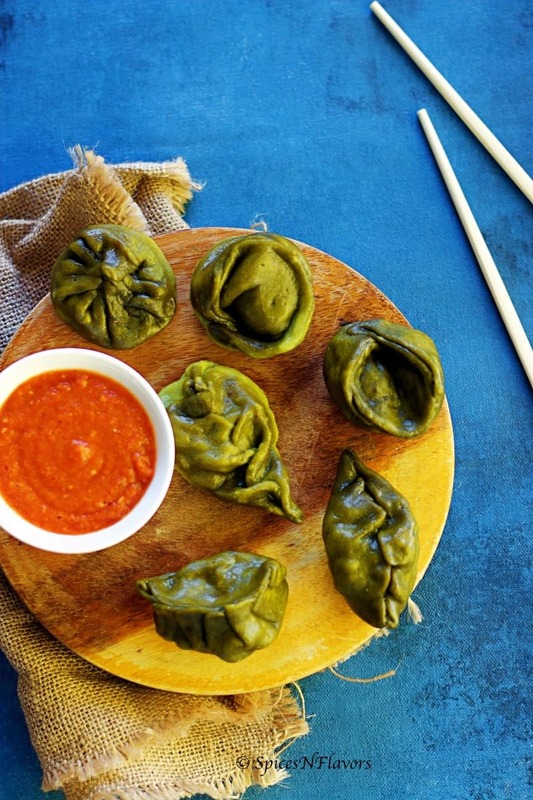 I paired up these Palak Paneer Momos with hot and spicy Momos chutney. It was such a deadly combination. Since the chutney is meant to be super spicy; I made the momos little less on the spicier end. You can however adjust everything to suit your needs. These Palak Paneer Momos had a very thin layer of dough. Note this point carefully that you have to roll the dough thinly or else the thicker the dough the less tasty it would be. Coriander and Mint Leaves brings in so much freshness don’t skip it. It adds so much life to the stuffing. The different textures of Paneer, boiled potatoes and onions coming together with the little use of spices makes this a complete package. By the way don’t forget to comment below and let me know which is your favourite Indian street food? 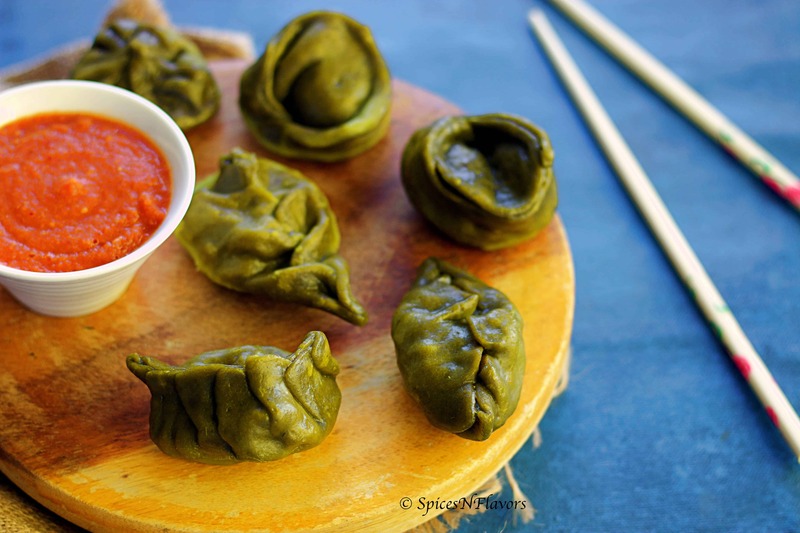 Here is a detailed recipe and a step by step instruction on how to fold palak paneer momos. 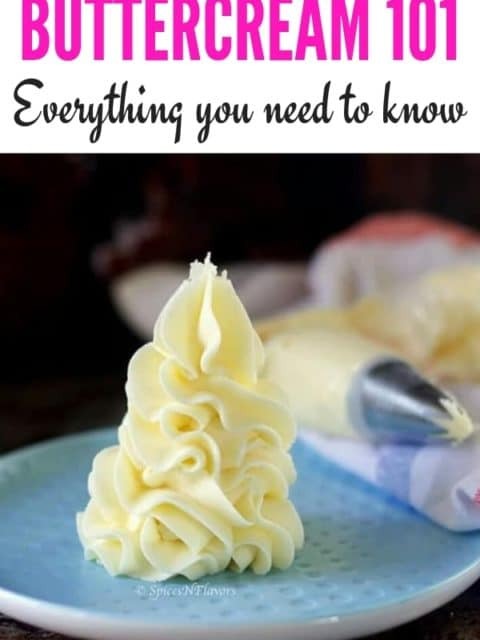 Fill the rolled out dough with filling. Apply some water to the sides and bring the sides together to create a half-circle. Press the centre and bring the edges together to create this pocket style momos. Gather the pleats to the centre just like the way do while making a stuffed paratha. Start by pleating the momos from one end. Just make 2 pleats and press it together. 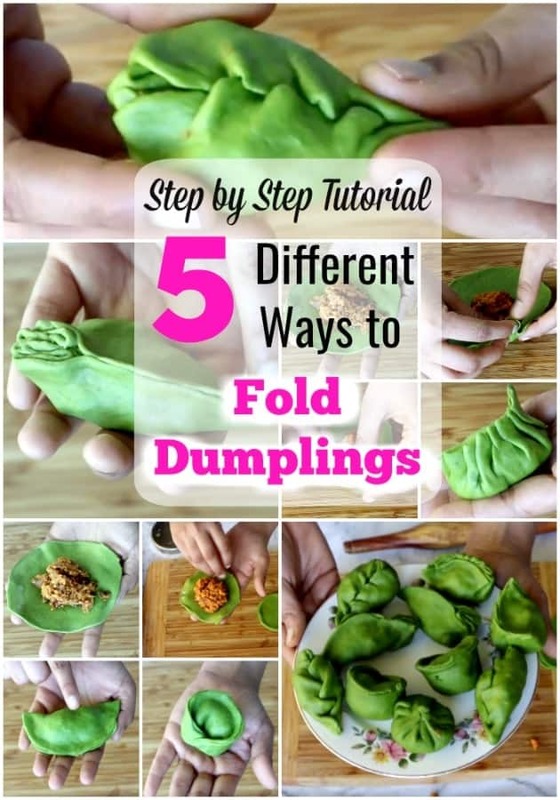 Then just press the remaining portion of the momos together to create pleats at one end and the rest of the portion unpleated. Make the pleats just like we did above. Bring it to the centre and press down. Cross-over each side of the remaining part of the momos to create this beautiful zig-zag crossing over pattern. Make pleats like we pleat a saree on one side of the momos. Press the remaining semi-circle to the pleated side to make this type of momos. For even better understanding refer my video on palak paneer momos. Add the puree to the maida and salt mix; and make a smooth dough. Cover and let it rest for 20 mins. Meanwhile heat up oil in a pan, add cumin seeds. Let it splutter and add onion. Saute it for a minute and add in the ginger-garlic paste. Once the raw smell goes add in the chilli powder and turmeric powder. Cook until the masala smell goes away. In goes the potato and paneer. Salt to taste. Mix everything well. Transfer to a bowl and let it cool. Once cooled, add in the chaat masala, lemon juice and coriander leaves. Give a good mix. Our dough has been rested and stuffing is ready. Time to make momos. To make the patterened momos refer my video by clicking here. Once the momos are ready, its time to steam them. Bring a pot of water to boil, meanwhile grease the steamer plate with some oil; place the momos in it. And once the water in the steamer boils,put the plate into the pot and steam cook the momos for 15 mins. 1. If you do not wish to use spinach puree, you can follow the same procedure using plain water to bind the dough. In that case it would be normal Paneer Momos. Adding spinach increases the nutritive value and also is appealing to the eyes making it kid friendly recipe. 2. Roll the dough as thin as possible, the thinner it is the better it tastes. 3. You can use any stuffing of your choice. 5. You can make the shapes ahead of time and keep it covered. Steam it when you are ready to serve. Serve them with these delicious Momos Chutney. Since it is Rakshabandan you might want to check my 15 min Paneer Parfaits to serve to your guests. If you try this recipe then do tag me, tweet me or instagram me. I would love to see your creations and follow your posts. See you soon with some interesting recipe..
Can you please give receipe for momo’s chutney? ?